penalty area with goal, as illustrated. 3 Attackers plus 2 Servers. • Supply of balls with A’s & with S’s. at goal from an angle. moving into scoring positions from outside area. • Employ power & placement skills when striking on goal. • Clean contact on ball with a chosen part of body or foot surface. major goal-scoring areas within penalty area. • Strike with power & accuracy from a distance. • Keep ball low when striking at goal. 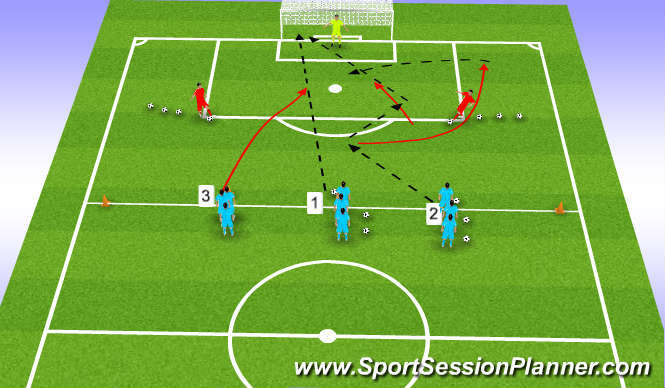 • Deliver crosses accurately, avoiding GK’s intercepting range. • Early decision on selection of technique to use, striking at goal. • Contact ball with precision & excellent technique.